Don’t you love a good jerk seasoning? Jerk cooking originated in Jamaica and you’ll get all those wonderful Caribbean flavors when you cook with these spices. It is traditionally used with chicken, but it works great over shrimp and other seafood. I’m not very picky in how I use it. When I want jerk spice, I want some spice! With these flavors, it can work with any protein of your preference. Tofu, anyone? Why not? It also works on vegetables, like grilled corn on the cob. Vegetables love a good spice rub. 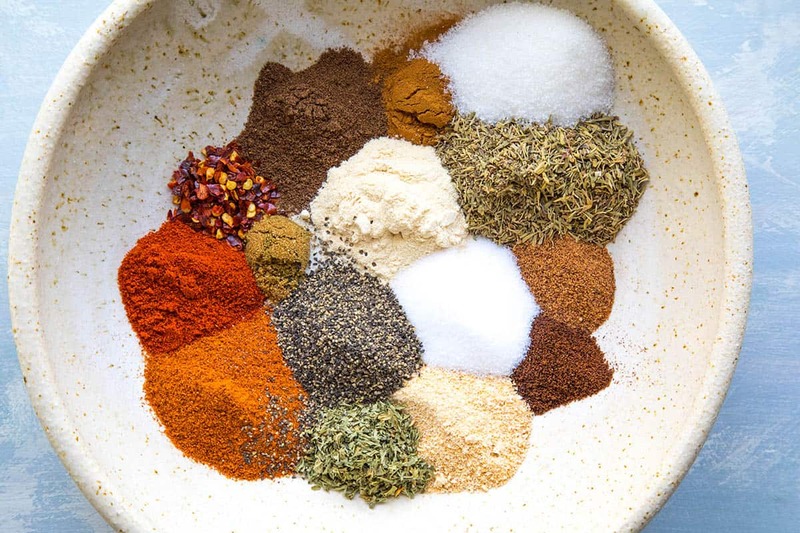 There are quite a lot of seasonings that go into this jerk seasoning – fifteen, to be specific, with my personal blend. You can easily buy some from the grocery store or your favorite online spice shop, but I like to make mine at home. It is so much better when you make it at home, as you can control everything that goes into it. First, I can emphasize certain ingredients over others. Want less clove? No problem. A bit more allspice? Go for it! Secondly, I can easily slip in a few (or more!) dashes of a superhot blend that I’ve recently dehydrated. Consider this! A Jamaican Jerk Seasoning blend with a half teaspoon of Moruga or Reaper powder? Oh yeah, some extra heat for me. So happy! Consider the addition of the Scotch Bonnet or habanero, something more local to Jamaica. What Ingredients Go Into Jamaican Jerk Seasoning? Once you’ve gathered up your ingredients, add all of them to a small mixing bowl. Mix it all together evenly. Make sure it is nicely uniform. BOOM! DONE! 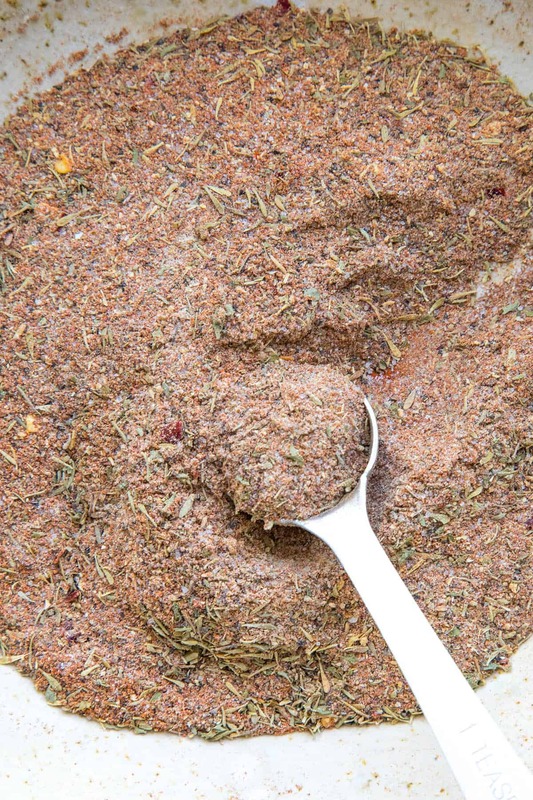 You now have your own homemade Jamaican jerk seasoning blend. Have it! Store in an airtight container. Use as needed. As mentioned above, I like to sometimes slip in some spicier chili powders into the mix. Ghost pepper powder is probably a favorite. Not a lot, mind you. Just a pinch or so to bring up the heat for me. If you can get scotch bonnet powder, that would be awesome. I like to dehydrate my own scotch bonnet peppers, then grind them into a powder for this recipe. You can easily adjust the ratios to make it your own personal blend, though. Bump the garlic, double the cayenne, cut back on the onion, dial back on the sugar or use brown sugar instead. It’s your blend now. This is my favorite jerk seasoning recipe. One of the best spice blends out there. Why is it Called “Jerk”? Jerk is the term used for the style of original Jamaican cooking, which is poking holes into meat so it can be permeated with more flavor. This is called “jerking”. “Jerk” became associated with the particular spice rub used to spice up those meats, and the name stands today. 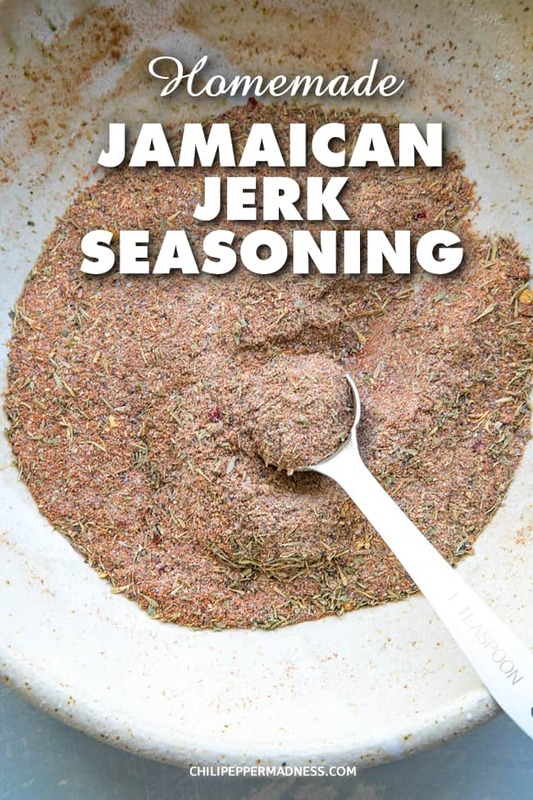 Jerk can refer to jerk spice blends, jerk marinade, and the cooking technique in general. What is a Good Substitute for Jerk Seasoning? There really is no good direct substitute for jerk seasoning. 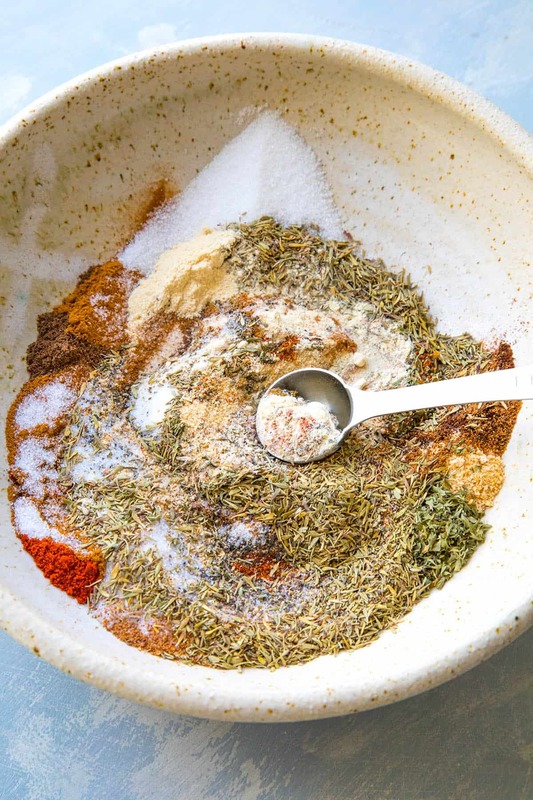 If you are unable to find a Jamaican or Caribbean jerk blend at your local grocery store, your best bet is to make it yourself using this recipe. However, if you are unable to find certain specific ingredients, try to get as close as possible with what you are able to obtain. Or, try taking a Cajun Seasoning or Creole Seasoning blend and add the following ingredients: Brown Sugar, Nutmeg, Cinnamon, Clove, Allspice. That might get you fairly close. 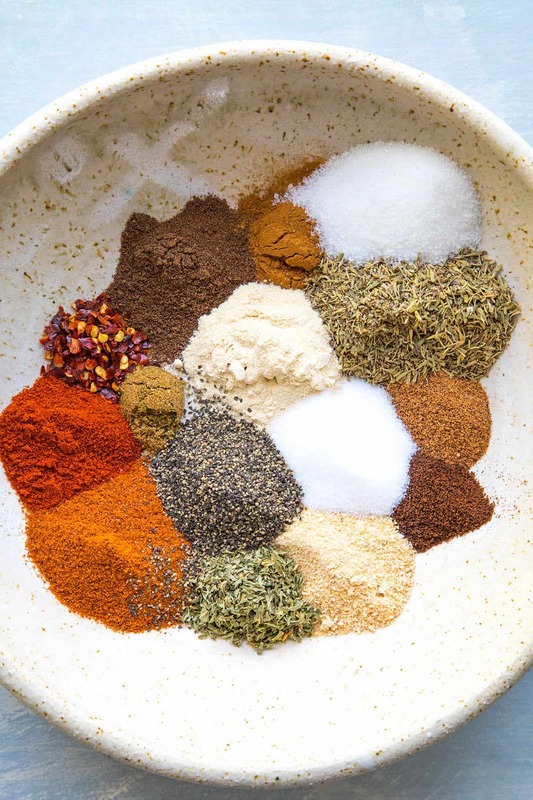 Make your own Jamaican jerk seasoning blend at home with this easy recipe, filled with loads of piquant and aromatic spices. Add all of the ingredients to a small mixing bowl. Mix it all together evenly. Makes about a half a cup. This recipe was updated on 4/15/19 to include new photos and information. It was originally published on 10/4/15. Is this a dry rub? No water is added? Patrick, yes, this is a dry rub/seasoning. How manu teaspoons of sugar? Thanks! REPLY: Kelley, 2 teaspoons. — Mike from Chili Pepper Madness.